By a meta-log I mean a written device which identifies a word or a phrase for a comment and does not involve the meaning of the word or phrase. In a sentence this means that the subject of the sentence is not what the word denotes, but that the word is an object for discussion. It can occur when I talk with others about how a particular word or a phrase is being used in ordinary speech, or in writing, as when an author is discussing how a word or a phrase has been used by another person. The prefix *meta*, was used by Aristotle (c. 360 BC) to refer to a topic in retrospect. *Metaphysics* therefore was a discussion about material matters he had studied, a reflection about its first principles. It could be translated as “after physics”, or “thinking about physics”. Over successive the centuries the meaning of the word Metaphysics shifted substantially so that most people now equate it with “Pure Philosophy” as distinct from its specific areas, say, Logic, Political Philosophy, Ethics, Aesthetics. *Meta* as here used has been combined with *log*, as in *meta-log* and has been assigned a distinct, unambiguous meaning: a way of identifying words, phrases, even sentences when these are being talked about, or discussed — that is, are the subjects of a thought — and are not used in their normal, denotative way. A problem arises however, when talking, speaking or lecturing, and not writing particularly in the latter situation, when lecturing. The speaker may wish to talk about a concept and in order to retain the interest of his audience, he raises or lowers his voice, adjust its volumes, perhaps also gesticulates in various emphatic ways: raising eyebrows, wrinkling his nose, looking skywards (a sign of desperation perhaps) and — using gestures like marching up and down the stage, or raising his hands to show the importance of what is being discussed. All these are aids which he hopes enlivens his presentation, give emphasis to particularly ideas, maintains the interest of the audience. We can refer to the lecturer punctuating his material, bringing it to the attention of the audience, making certain items more memorable. One widely used gesture which shows that something is being quoted from another source, is to raise one’s hand, extend two fingers and rapidly flap these. These are air quotes (shown above) — visual quotation marks! It shows that the words are a quotation, or refers to a concept which is widely used but which does not necessarily meet with the approval of the speaker himself. For years I used this sign whenever I used the word *instinct*, a term anathema to me at the time. The term is almost without meaning within contemporary academic psychology and, although widely used by the English speaking followers of Freud, it is a poor translation of the German word *Trieb* which means an impetus, or inchoate driving force. The term *instinct* on the other hand, as was used by some biologists at the turn of the 20th century, referred to an action pattern which was believed to be unlearned — that is, its origins were unknown — but is within the repertoire of an animal through a genetic (again, unknown) process. It was re-introduced by Konrad Lorenz and N. Tinbergen in the 1940’s but in a different sense to its earlier use. This simply added to the confusion. Tinbergen often referred to innate action patterns although his famous book was called A Study of Instinct (1951). But we also need a gesture to indicate that a term or expression is not a quotation from some existing text, but is a topic under discussion. If the subject refers to a fictitious event or something which is likely to confuse an audience, it has been customary to place it in gestural-quotes. My favorite example: the bandersnatch ( see Lewis Carroll’s Alice in Wonderland). Once an audience accepts the bandersnatch as a fictitious animal, which has been given an incoherent description in the poem “The Jabberwocky”, there is no need to place it in quotation marks, or give it any distinctive marking: the reader and an audience is now well prepared and is therefore unlikely to get confused. But when one wishes to discuss this “animal” and others of a similar nature, the discussion becomes “meta-talk” and one may wish to indicate this by using a distinct marker — or meta-log. In writing the meta-log I have suggested on an earlier occasion is *x*, where x refers to the object under discussion, whereas when an idea is involved which requires more than a label but an expression, we can use *xyz*. Time will tell what conventions will get adopted. In speech, or when speaking, I propose to use a sign which is easy to use to indicate that we are in “meta-talk” mode, that is talking about a concept. The sign involves raising both hands in clinched form to shoulder level, then quickly stabbing the air with both forefingers thrust forward, like an adder on the attack. 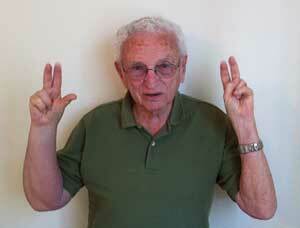 The gesture is the same whether using a single word or a whole phrase. The audience will very quickly learn what meaning is being conveyed and distinguish a quotation from a comment about the status of a concept! The problem I am currently facing is very common, and the two solutions I offer may appear retrogressive and not welcome. Nevertheless, I urge that my second suggestion be adopted. The problem arises when one wants to refer to a word as an item in a language regardless of its meaning. In my case, I am currently writing about the role of language in the genesis of theories about natural and social phenomena. It often requires that I talk about specific words and phrases, how these get to be used in different circumstances and contexts. 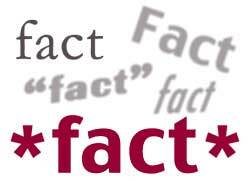 The word that comes up most frequently is in fact, fact — a highly ambiguous word with several different meanings. In the past, whenever I wrote about facts, what these are, how this word is used in different circumstances, I adopted the common convention of using italics, but more recently I adopted the habit of capitalizing the first letter of the word under discussion, as in Fact or its plural form, Facts. I found this to work quite well. But capitalization has its own problems, as can be seen until recently in German, where there are many rules as well as a great many exceptions to them. It took German children much time and effort to learn to spell correctly — many did not succeed, and often failed school because they were deficient in orthography! Foreigners just got overwhelmed, got lost in the fray and were readily forgiven by natives for their orthographic transgressions. This changed in 1996 when the German government decreed that it was only mandatory for all nouns to be capitalized, as well as personal pronouns as a matter of courtesy. Of course not all previous conventions were set aside, but much became discretionary rather than decreed. The young celebrated, older people more often bewailed what they perceived as a decline in standards. And there the matter rests. In English – as just demonstrated – matters are not entirely simple either. The personal pronoun, I, is capitalized, but not others. When writing about the queen, write Her Royal Highness Queen Elizabeth, or about The Lord Mayor of London, Sir Alex Appleby, given that names should be capitalized, as in other languages, but also any titles that go with names! Writing sir or mr. Alex Appleby would be orthographically unacceptable in English. These conventions are easily learned and are not cause for being failed in examinations at school or university, as once was the case. In English, then, only the name of a person, as in Jon Henry, or Queen Elizabeth, God, the personal pronoun, special names like the Ministry of Transport, companies, compass directions and the names of continents, countries, counties, provinces, cities, hamlets and, of course, the first letter of a new sentence need to be capitalized. English has other orthographic problems made worse by the fact that there is so little relationship between the pronunciation of a word and its spelling. Some writers, like Charles Dickens, simply wrote in imitation of sounded speech – which often makes it awkward to read. Speed-readers beware. My suggestion here is that when one writes about a word, the word referred to be presented in one of two alternative ways: by capitalization, so that instead of writing that the use of containers should be restricted to containers used to transport bulk, we write that Containers are used to refer to containers employed in bulk transport, not to items like individual pots and vases. Similarly, we write that philosophers use Facts in different ways when this refers to data and not to the confidence someone has in a record of a particular event. Why not use italics rather than capitalizing? As a matter of fact, this is often done. We then write that philosophers use fact in different ways, including to refer to data but also to the confidence one has in the reliability, or the accuracy of the record made of an event! However, this proposal adds confusion given that we already have conventions for using italics, such as to add emphasis to a word or phrase, that work quite well. Extending their use, therefore, confuses rather than clarifies. A different way of solving my original problem is to use asterisks to mark the critical word – or more importantly – phrase. Write *fact* when discussing this word as a word, not its meaning. Similarly enclose a whole phrase when the phrase is to be discussed without regard to its specific meaning, as in *on the wrong side of the road*. This phrase has two different meanings, namely, travelling on a road but not on the side prescribed by law. This is its literal meaning. Its other meaning is analogical, namely that one is oppositional, acting contrary to what is generally done. The use of the asterisk helps to discuss the phrase without arguing about its proper use. Time will tell which of these two options will be adopted. In the meanwhile I may try out which one suits me best. I hope others will follow my suggestions – and that they will let me know.